Graduation tassels are important. 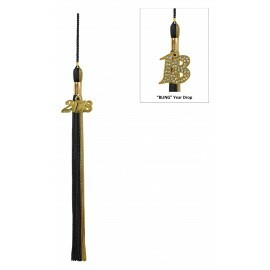 We have a vast selection of academic graduation tassels that include a current year signet for perfect keepsakes to keep memories of your graduation day alive for many years to come. Gradshop.com offers over 144 possibilities of color combinations of high quality high school graduation tassels that can be purchased in addition to any of our gown, cap and tassel packages. When buying in bulk, Gradshop.com gives astounding discounts that you won’t find anywhere else! View our extensive line of high school graduation products to accommodate your academic requirements for superior quality, inexpensive pricing and a great selection of processing and delivery options. Through years of providing graduates with the best high school graduation apparel and accessories, GradShop.com has built a solid reputation as one of the leading manufacturers and providers of graduation essentials. Our dedicated and sincere team is ready to assist you with any and all your inquiries and orders. Call us now for more information on our outstanding high school tassels product line.